There's a famous spot off Northern California's Half Moon Bay called Maverick's, where some of the world's best surfers ride waves that often get as high as 50 feet. But a Pacific storm last week created 80-foot waves there. Even many of the world's most accomplished surfers thought the mega-waves were too dangerous. But some brave -- or is that crazy?! -- souls saw them as a challenge! One high-profile surfer, Peter Davi, died in the monster waves, further down the coast. At Maverick's, some suffered epic wipeouts and are lucky to be alive -- including surfing legends Peter Mel and Darryl "Flea" Virostko, who described the experience on The Early Show Friday, along with star surfer-turned-videographer, Grant Washburn. He had his cameras rolling as Mel and Virostko did their thing -- big-time. One of "Flea's" wipeouts was-- to longtime surf watchers-- among the worst they had ever seen. Washburn acknowledges it was like watching a train wreck: You wanted to turn away, but you just couldn't avert your eyes -- as the surfers got swallowed up by gargantuan waves. But he rushed to help Virostko when Virostko wiped out. Mel and Virostko say they don't see themselves as reckless thrill-seekers. They say they took as many precautions as possible, wearing life vests, using personal watercraft, and having partners looking out for them. But both admit they feel darned lucky to have lived to tell about their tussle with the almost unprecedented waves. "You make a little mistake, and you pay for it (by wiping out)," Mel told co-anchor Julie Chen. "It was pretty scary, but it was good to be a part of it, and survive it, really." Mel admits, "We've probably got a screw loose here and there" to battle such conditions, "but we play if pretty safe. We take a cautious approach." 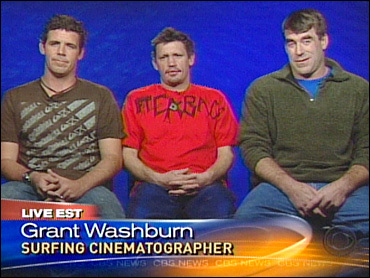 For much more on this, head to www.maverickssurf.com and www.grantwashburn.com.